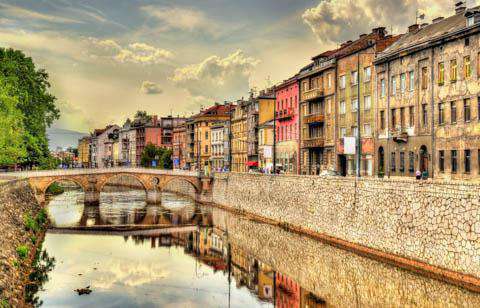 How much does it cost to travel to Sarajevo? How much money will you need in Sarajevo? KM103 ($59) is the average daily price for traveling in Sarajevo. The average price of food for one day is KM46 ($27). The average price of a hotel for a couple is KM78 ($45). Additional pricing is in the table below. These average travel prices have been collected from other travelers to help you plan your own travel budget. How much money do I need for Sarajevo? Sarajevo is the capital city of Bosnia and is one of the most culturally and historically interesting cities to visit in Europe. The city was at the crossroads where the Eastern and Western Roman Empires divided, and the Roman Catholic and Eastern Orthodox Churches divided. Today it is most associated with the Civil War that occurred here between 1992 and 1995. There are still many remnants of the war left, from the cemeteries that dot the countryside to the leftover damage done by bombs. Despite its brutal history, Sarajevo has begun to thrive again, both economically and as a tourist destination. The people in Sarajevo are incredibly welcoming and friendly. There is a wonderful old town that has many market streets where you can buy anything from produce to souvenir tea sets. The old world architecture is unlike anything you'll find elsewhere in Europe. Head into the surrounding hills if you're looking to get out of town and see daily suburban life in Bosnia. It does make for an enjoyable walk and you can enjoy good views looking back at the city. Do stay on the paved roads and be aware of stray dogs in the area. Rabies is not that uncommon. Sarajevo's climate has four seasons with January being the coldest month and July the warmest. It is generally cloudier during the winter months and clear during the summer, but rain falls consistently throughout the year. Winter sports are common and in 1984 the city hosted the Winter Olympics. Wandering around the Old City is a unique experience in and of itself. Interesting sights around town include the Latin Bridge, the Yellow Fortress, Markale Market Place, Vrelo Bosne, the City Hall, and Morica Inn. Popular museums include the Bosnian Historical Museum, the National Museum, the Sarajevo War Tunnel Museum, the Sarajevo City Museum, and Svrzina kuca. Religious sights include the Old Orthodox Church, Emperor's Mosque, Bey's Mosque and St. Anthony's Church. Sarajevo proper has four main districts including Centar, Novi Grad (the New City), Novo Sarajevo (New Sarajevo) and Stari Grad (the Old City). The Old City has many cobbled streets, interesting mosques and a variety of shops that appeal to tourists. It is a unique experience to hear the call-to-prayer and get lost in the history and culture that make up this area. Popular festivals in Sarajevo include the Sarajevo Film Festival, the International Theater Festival, and the Sarajevo Winter International Festival. Winter sports are also popular in the area. There are two Olympic grade mountains nearby that have ski trails. Sarajevo also has a great night life. There are many different pubs, bars and clubs that each have their own style and atmosphere. The most popular nights for going out are Thursday, Friday and Saturday nights. Thursday is particularly popular for the student population. Bosnian food is delicious and Sarajevo has some of the best. Budget food options are plentiful and usually incredibly filling. Burek is a local specialty and is a meat pie that is made with phyllo and seasoned meat, cheese, and vegetables. It's usually served with a generous helping of a yogurt cream sauce that is comparable to sour cream. You'll also find pita sandwiches, pizza, and cevapi around town, all for very reasonable prices. Cafes are also quite popular in Sarajevo and they're a great place to try a cup of Bosnian coffee. It's rich in flavor and for some is an acquired taste, but many find it quite delicious. Navigating the streets of Sarajevo can be difficult because the streets are not well labeled. It's recommended that you buy a map before you head out to explore the city. This will save you at least some frustration. There is public transportation throughout the city. There's a tram that makes a counter clockwise loop through the central district. Make sure you validate your ticket as soon as you board the tram. Ticket inspectors are not uncommon and you should not attempt to ride without a ticket. Use caution when taking a taxi as they are prone to overcharging tourists, particularly when you pick them up at the train or bus station. Make sure you have some idea how much the trip should cost. If possible, try to arrange a pickup through your hotel in advance, to ensure that you avoid any sort of taxi scam. Bosnian food is absolutely delicious! It can be hard for vegetarians to find options, but if you're not a vegetarian, the selection is delicious. Definitely try the Bosnian burek, which is a local fast food specialty. Burek basically consists of tubes of phyllo bread stuffed with a meat concoction, spiraled into a pan, and baked. It's served with a generous portion of sour cream. It's definitely not a healthy option, but it's filling and cheap, and a must try experience while you're traveling in Bosnia.